This delicious peri-peri sauce goes with just about anything – try it with chops, steaks, seafood, or even to take your snags to the next level. But on a butterflied chicken roasted over the coals of firewood you've collected? Perfect! 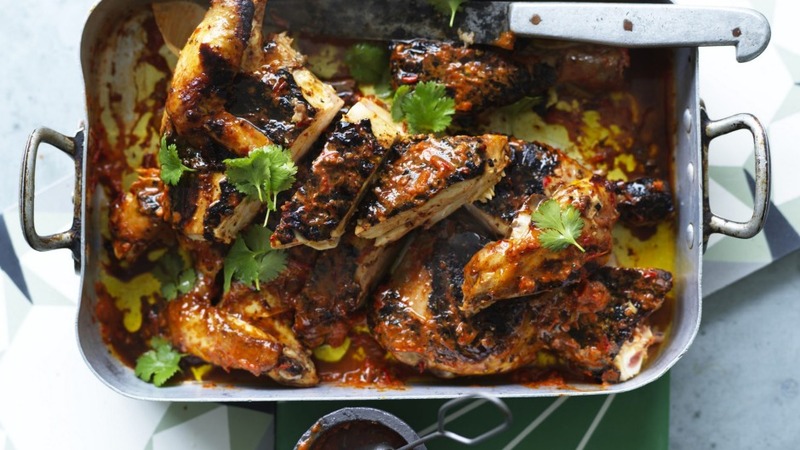 Make the peri-peri sauce ahead of time. For the sauce, heat your oven to 200°C (180°C fan-forced). Place the onion, garlic, chilli and capsicum on a lined baking tray and bake for 20 minutes. Allow to cool to room temperature. Combine the roasted vegetables with the remaining sauce ingredients and blend to a smooth consistency. Transfer the sauce to a small saucepan, simmer for around 10 minutes, then transfer to a container. Refrigerate until ready to use. When ready to cook, heat a barbecue to low-medium heat (if using a campfire, the coals should be quite low). Wrap a brick or heavy rock in aluminium foil. Cut the backbone out of the chicken and press down on the breast to flatten it. Brush the chicken all over with the peri-peri sauce. On a grill placed over a low campfire or barbecue, cook the chicken skin down for 20 minutes with the rock or brick on top. Flip the chicken over and cook for a further 15-20 minutes, basting again with the sauce when you flip the chicken. Rest the chicken for 10 minutes, then serve with a little extra sauce if you like. If cooking this at home, heat your oven to 200°C (180°C fan-forced) and roast the butterflied chicken for 45 minutes, then finish the chicken skin-down on a hot barbecue, grill pan or frying pan to char the skin.